I paid a visit to the newly designed Michael's in Hurst Sunday. WOW!! What a difference .... the entire center section was for scrapbooking & paper crafts. Paper, tools, embellishments, stamps, ribbon .... everything was there. 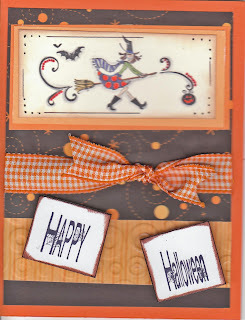 I picked up this fabulous Penny Black Magic Broom Flourish stamp and could hardly wait to get home and ink it up!! The black dp is from a Mat Stack I had from 2-3 years ago. The stripe I put thru my Cuttlebug with the circle designs. The sentiment stamp is from the $1 bin at Michaels last year (what a find). I really like the way this card turned out. Thank you for stopping by my blog.